The 2016 HZZK project results provide a catalyst for change to the highly contaminating brick industry of the developing world. The HZZK provides a clean brick firing solution to the environmental and production challenges of the brick industry using authentic zig-zag technology as designed by the inventor of arch less zig-zag technology – Alois Habla. 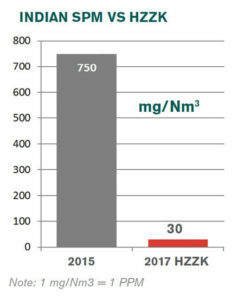 The HZZK successfully replaced the high-polluting, energy intensive South African clamp kiln in 2016. HZZK = 0.74 MJ/kg fired brick indicated an 81.5% improvement when compared to the SEC of the South African Clamp = 3.99 MJ/kg fired brick. Emission results were independently monitored and the results indicate world leading outcomes. Negligible particulate emissions particularly of black carbon and short lived climate pollutants (SLCP’s). 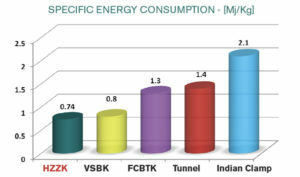 Results reflected a dramatic reduction in coal use and an 82% reduction in fuel consumption compared to the SA Clamp kiln. 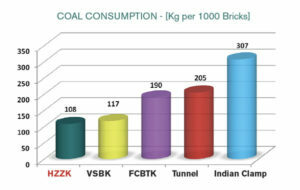 Coal used per 1,000 bricks by HZZK at 108kg compared to the South African Clamp Kiln at 583kg per 1,000 bricks. Results were measured at 30mg/nM3, well below the legislated South African emissions limit (50mg/nM3). Results were measured at 50 mg/nM3 which represents a potential 80% reduction when compared to the South African limit of 400 mg/nM3. This co-pollutant is known to cause asthma respiratory disease and to contribute to ‘acid rain’, in turn impacting agricultural production. Monitoring showed negligible deposition of particulate matter (PM) from the HZZK. Roll-out of HZZK clean technology will remove the now prevalent black carbon emissions (smoke plumes) of current kilns in developing countries and improve air quality and pollution. The HZZK offers major change to the brick industry of the developing world with consistent, high quality brick production, energy-efficiency (fuel savings, from any source), and pollution reduction enabling workplace, agricultural and health improvements for local and regional communities. * (Citation: Chandra Bhushan, Dr D.D. Basu, Nivit Kumar Yadav & Rahul Kumar 2016 “A scoping paper, Centre for Science and Environment,” New Delhi 2016.